Find out more about what project management entails, who is involved, common challenges and success factors. You might not be trained in project management, but you sure do have to do project based work at some point in your career. Almost every job in today's competitve business environment entails some degree of project management and even those among us who are not project managers by education have to use the skills of a project manager. This is largely due to the great diversity of the project management discipline. A great variety of industries and professional fields specifically ask for project management skills, and attaining such skills can result in a real career boost. We compiled information to help you get a better idea of what project management entails, who's involved in a project and their respective responsibilities, as well as common challenges that are faced in project management and decisive factors for successful project delivery. While once delegated to a function within other jobs, project management now is even a distinct career itself – and one of the most famous interdisciplinary professional careers, too. According to the Project Management Institute (PMI), project managers currently enjoy a very healthy job market and prospects of future growth. High-tech industries have especially bright prospects when it comes to careers in the project management field. The field of project management not only is an attractive one from a career standpoint. A recent GPM research study shows that project based work leads to a high work satisfaction rate among employees. Project management is the discipline of planning, managing, organizing, and monitoring all project related tasks as well as guiding everyone involved in the project. There are a variety of techniques and methods that project managers can use to drive their projects to success. Apart from the methodological aspect of project management, there is a wide range of skills a project manager should bring to the job. Read more on what makes a good project manager. Like most undertakings, projects need to be performed and delivered under certain constraints. 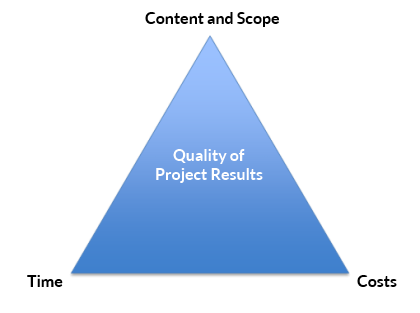 Traditionally, these constraints are referred to as the three sides of the “project management triangle”: time, cost and scope. All project management parameters draw on the same resources and therefore, changing one side of the project management triangle inevitably will affect the other sides. The project manager has to ensure a reasonable and balanced allocation of all resources for successful project management. Project management is typically team effort. The project management team, consisting of team members and the project manager, joins forces to meet unique goals and objectives. According to project experts, a team size that exceeds seven members is not advisable. When managing large-scale projects, it can be helpful to divide the project into smaller scope sub-projects. This reduces some of the complexity of project management because it allows project teams to focus on a smaller project scope. All project teams, no matter which sub-project they work on, report to one project manager who is responsible for the overall project success. Ideally, the team members not only have solid professional expertise but also strong project management skills. Completion of tasks such as project communication and giving feedback on project progress are essential for successful project completion. Another critical aspect to project management is the assignment of project specific roles to the team members. Everyone involved in the project should know what their specific tasks and responsibilities are. The wider circle of stakeholders within a project includes initiators, principals, external partners (e.g. consultants and service providers) and others including all internal and external interest groups such as administrative institutions as well as trade unions. Project managers are accountable for achieving the stated project goals. Their key responsibilities are the careful planning and management of the triple constraint (time, cost, scope) to ensure a successful project closure. Additionally, project managers need to ensure project quality and keep an eye on potential project risks. In many cases, project managers have only task-related authority but lack managerial authority over their team members which can make successful project management more difficult. Apart from their professional knowledge, project managers should be proficient in project management. In order to succeed in project completion, it is essential that they are effective problem solvers, have excellent team building and leadership skills as well as a strong ability to clearly and concisely communicate. The Standish Group regularly publishes the Chaos Report, providing statistics on project management success and failure. One of the key success factors in project management is a professional project infrastructure. Executives commonly believe that projects can be managed on the side when in fact project management is a demanding full-time job. Installing professional project management control and monitoring instruments significantly increases the chances of success. Every project should have a clear goal that adds substantial value to the company. As banal as it may sound, a great number of projects are initiated and realized merely for reasons of prestige. The project plan should include fixed deadlines and a financial framework as well as counter-measures in case those limiting factors are overrun. Defining critical project factors is essential for the success of any project and continuous changes to project parameters can negatively affect the project outcome. In addition to the internal factors, project management is greatly influenced by a varietey of external factors. A project’s success greatly depends on its acceptance and support from the corporate management. The successful completion of a project is endangered if the executive level and other stakeholders do not or no longer back the project. Successful project management also strongly depends on the overall project infrastructure. The project team can only work at its full potential if all relevant project management resources are available, e.g. equipment and facilities. Only seldom can project managers rely on manpower that is exclusively dedicated to their project. 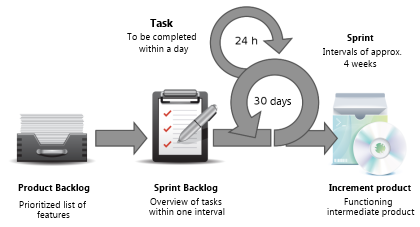 Typically, team members have to fulfill their project tasks on top of their regular responsibilities within their departments, complicating the project manager’s tasks. Other common challenges associated with project management is the organization of data and information as well as ensuring that every project worker is kept up to date on project progress and deadlines. The cost constraint requires close monitoring of the project budget and keeping it under control. In order to have a good idea of the specific challenges, project managers should do a project risk analysis. Project management methods and strategies can be divided in two major, greatly different approaches: the classic approach and the agile approach. The agile approach to project management is rooted in the field of software development but has been used more and more in a variety of industries. Classic approaches to project management are the waterfall model, bar charts and PRINCE 2. They are based on the assumption that a very precise definition of project goals is the fundamental basis for project success. Therefore, classic project management approaches require very detailed forward planning of all project related activities, logic dependencies and timely sequence of all meetings, deadlines and milestones. The underlying principle of agility is the iterative process. When employing agile project management methods, it is essential that the project target allows room for divergence. This project management method can only be successful if all stakeholders can agree on a flexible – therefore agile – project plan. At regular intervals, the client receives a fully working intermediate product, allowing for continuous monitoring of the product development process because the client can give feedback early on. Based on the insight gained from the client’s feedback, the project management can adjusted the original project plan and the newly gained knowledge can be used already for the next intermediate product. In the meantime, both contractor and contractee can reassess their project goals and adjust them according to the changed project conditions. When it comes to project management, there is no one best approach. A great number of factors such as the corporate environment, all stakeholders and the project target are only a few of the factors that need to be taken into consideration when choosing the project management approach and method. So called hybrid project management approaches combine elements of classic and agile project management methods. Depending on the project phase and activity, it can be best to apply different project management methods just like picking the right tool form the tool box for each job. One of the most important success factors in project management is a well-functioning communication concept. There are a great number of reasonable ways to make project information accessible to team members. Especially with complex projects, it is essential to structure information well, preventing information overload and making sure that the required information is actually delivered to the recipient. Some important communication channels are status-meetings with all stakeholders, telephone and video conferences. Project related documents should record all relevant information and decisions. Project management can benefit from borrowing knowledge management techniques: Wikis, for example, are great tools to collect and exchange information. When it comes to project communication especially, using project management software can be very helpful. With the aid of project management software, the multitude of project information can be easily structured, processed, and delivered. Who completes what tasks by which deadline? What work package and activity has already been completed? Which is the current version of a project related document? The manual distribution of project related information often times leads to errors. Important team members and project stakeholders can easily be overlooked in the communication process if information is forwarded via phone and email. A certain degree of automation is helpful in streamlining the project management process. Project management software can be of valuable service, supporting the whole project team on a daily basis. A growing number of project teams are in search of a comprehensive project management system that is an adequate alternative to Microsoft Project. Aided by a suitable project management software even complex projects remain transparent and easily manageable, leaving more time for the all decisive operative tasks. Project Management - Bringing order to chaos • Copyright 1999-2019 © InLoox, Inc. All rights reserved.